Addressing Teen Dating Violence - Family Times is an award-winning magazine with staff-written news, feature stories and artwork that inform and inspire Central New York parents and their children. Here’s what the therapist says: Teens are new at dating and what happens during those first experiences can have a big impact. Patterns for adult relationships can be laid down during adolescence. 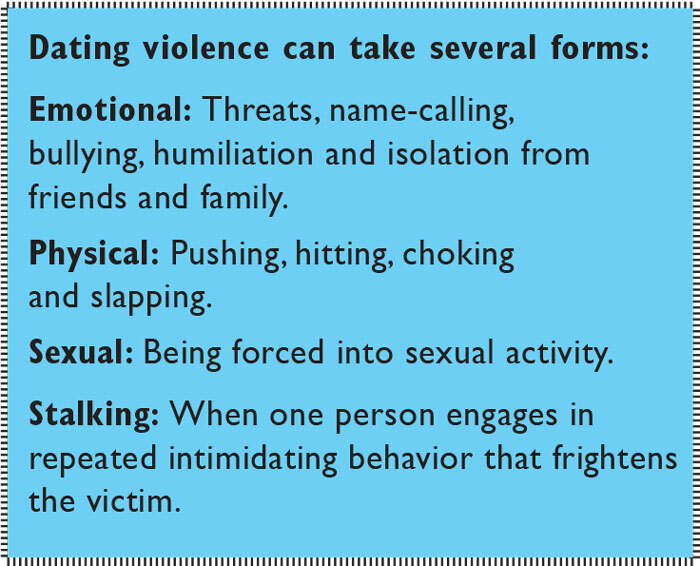 When abuse or violence is part of that experience, it often results in both short-term and long-term difficulties such as poor academic performance, depression and increased use of alcohol and drugs. Dating violence among teens is more widespread than most adults think. In 2011, 9.4 percent of high school students nationwide reported being hit, slapped or physically hurt on purpose by their boyfriend or girlfriend in the previous 12 months, according to the Centers for Disease Control and Prevention’s Youth Risk Behavior Survey. Teens are also unlikely to report these events to an adult. Relationship violence is usually perceived as an issue for girls and the focus is on educating young women about how to stay safe. Yet the vital piece of educating sons is overlooked. Males perpetrate the majority of relationship violence; therefore, parents need to talk to their sons about healthy relationships as much as they talk to their daughters. Prevention is possible only when both sons and daughters are educated about the issue. Dating violence often starts with things such as teasing and name calling. These interactions have an undercurrent of control and anger. It’s not mutual back-and-forth or good-natured in tone. This can lead to more serious situations such as stalking, physical assault and sexual assault. As with all violence, it tends to worsen over time. Teen dating violence can occur in person or, in cases of emotional abuse and stalking, electronically through texting or postings on social media sites. Parents can also be aware of the atmosphere of the dating relationship. As the relationship continues, does your teen go from happy and excited to anxious, withdrawn and unsure? Listen for clues about her interactions and any indications of abuse or violence. Talk with her about healthy relationships. Let him or her know that when a person is in a healthy relationship, that person feels better about himself or herself when around a partner, not worse. 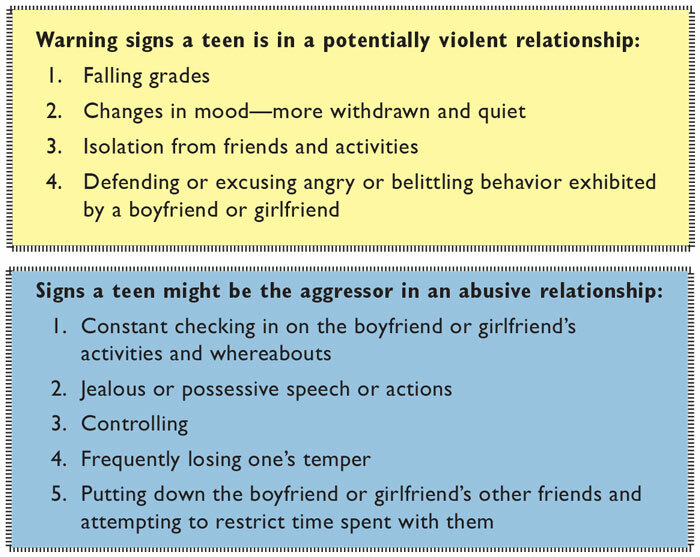 If you are concerned your teen may be experiencing dating violence, talk about the warning signs and voice your concerns. Reassure her she isn’t doing anything wrong and isn’t in trouble. If you aren’t sure if there has been violence in the relationship, make it clear she has a choice about dating this person but don’t insist they break up. You don’t want to create a situation where the relationship continues in secret. Provide opportunities for them to socialize under supervision, such as watching movies at your house. Let her know you are available to support her if needed. If you know for sure your adolescent has been abused, seek medical attention if needed and contact the authorities. Steps need to be taken to ensure her safety, and this means involving the police. Assure her she has done nothing wrong; comfort and console, don’t lecture or condemn. Despite your parental instincts, do not confront the abusive teen on your own. These confrontations can get out of hand and make a bad situation even worse. Let the authorities handle it. Focus on your child and providing support and love. If you suspect your teen is behaving in unhealthy or abusive ways toward his girlfriend, address it immediately. Talk with him about signs of dating violence and let him know what you observe. Let him know if the relationship has him feeling frustrated and un-cared for, he has a choice to break up. Explain he cannot control someone else’s behavior and trying to do so leads to unhealthy relationships. Expecting a relationship to resolve feelings of insecurity can lead to controlling behaviors, frustration and anger. Adolescents need guidance, education and support from parents in order to develop healthy relationship patterns. Adults’ relationship experiences can help your teen learn to navigate their own dating issues. Cary and Tonja Rector are married and live with their children in Manlius. Cary is a licensed mental health counselor and Tonja is a licensed marriage and family therapist.